Please people! Stop sending me this video! I mean no harm, this young man is very talented --- this music just isn't my thing!!! My love for the accordion....runs deep....through my veins...much like a favourite childhood recipe, your Grandmother's cooking, or the games you would play with your cousins in the field across the street. I feel like I am honouring my Mother when I play, and honouring my Grandmother, Grandfather, my ancestry in general. It brings in nostalgia that I didn't even know existed for me. It brings up feelings of a past I don't have - yet. 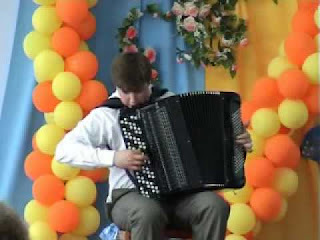 I love the sound of the accordion, but certain specific sounds. Let's get one thing straight: I love a polka - but only during Oktoberfest. This has been a strange blog entry, but I realise I should blog more about the music I like, and everything about the accordion I enjoy aside from the gigs I play, or who I have met. I will make a point from here on to post my latest suggestion of music that showcases the accordion.